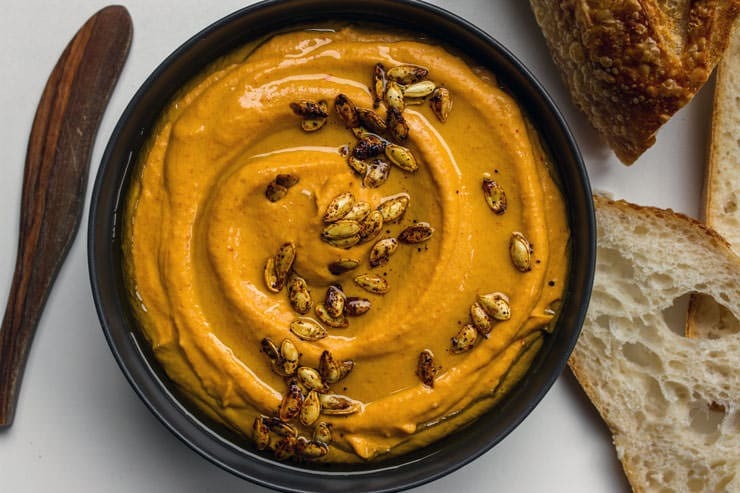 Roasted squash blended with pantry staples bring together this spicy, savory dip that tastes just like fall. When people ask me what I do for a living, I brace myself. It’s not easy to introduce oneself as an employee of the Joy of Cooking. I try to be casual about it, but eight times out of ten the person I’m talking to lights up. They tell me that they grew up with the book (or their grandmother had a really worn out copy), and then they want to talk about it for the next half hour, grilling me on its history, my favorite recipes, and my opinions on everything from organic farming to internet recipes. As a result, over the course of the six years I’ve worked for Joy, I have heard countless stories about the book. About how people grew up seeing the book on the kitchen shelf. About how their mother’s copy was so tattered they had to have it rebound. About how they buy every high school graduate in their family a copy. About how delicious the chocolate chip cookie recipe is. About how they make pancakes from it every Sunday. I hear these kinds of stories all the time, and I never get tired of them. In fact, they have a kind of galvanizing effect. This job is solitary—I work with my husband at home, and our work is very much behind the scenes. We edit, we write, we develop and test recipes, we post things on social media. So we typically only receive feedback through the filter of Facebook or email. As a result, we often ask ourselves whether we’re making any kind of impact. But when I talk to someone in person, and they eagerly tell me their Joy story, I stop doubting. The Joy of Cooking is a link between generations, between families, between millions of cooks. That apple pie recipe you like to make every fall? Your mother made it too. And your grandmother. Maybe even your great-grandmother. And the woman two doors down, and fifty other people in your city, and hundreds of people around the world. The Joy of Cooking is not just about recipes. It is a symbol of the community of cooks everywhere. It is a link to your heritage, and the heritage of cooking in America. It is a common denominator. If all that sounds a bit grandiose, well…it is a little. But it moves me deeply to consider that when I am in the kitchen with Joy, I am not alone. I am part of a community. And one of the things that makes October Unprocessed so powerful is the same idea—that doing something in community with others is empowering. Knowing that others have committed to the same ideal makes a challenge a little easier. But let’s be real: we’re all here for the food. This recipe was inspired, like most of the things I cook, by necessity. I bought a beautiful black futsu squash at the farmer’s market, and I wanted to turn it into something I could enjoy all week long—on toast in the morning, on a sandwich at lunch, or with carrot sticks and cucumber as an afternoon snack. 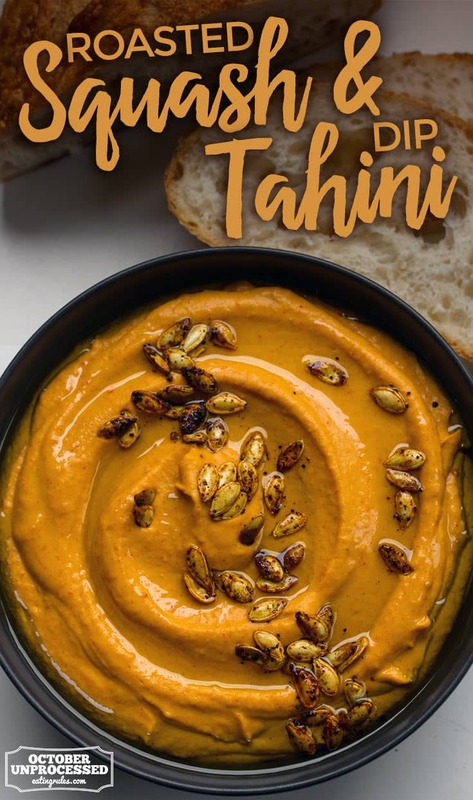 So I roasted the squash and combined it with some things that were already in my pantry to make a spicy, savory dip that tastes like fall. There are lots of ways to make this dip your own. You could add some roasted red peppers, spices like cumin and coriander, cayenne pepper for more heat, or throw in a chipotle en adobo. Instead of squash, you could use sweet potato. The nice thing about this recipe is that you can use it as a guideline, taste as you go, and decide when it’s just right. There are lots of ways to make this dip your own - add some roasted red peppers, spices like cumin and coriander, cayenne pepper for more heat, or throw in a chipotle en adobo. 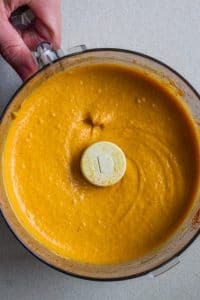 This recipe works best with dense, orange-fleshed squash such as butternut, rather than squashes like delicata or acorn. Preheat the oven to 375 F. Line two baking sheets with parchment. Halve the squash and scoop out the seeds, reserving them. 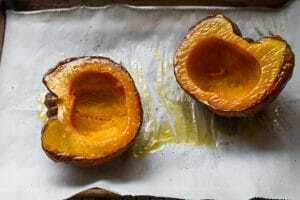 Lightly oil the parchment on one baking sheet and place the squash, cut side down on the oiled parchment. Place the seeds on the second baking sheet and toss with a little oil, salt, and pepper. 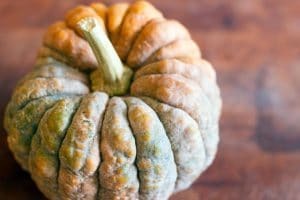 Remove and discard any large pieces of squash membrane from the seeds—small bits are okay—and spread the seeds in a single layer on the parchment. Place both baking sheets in the oven and bake the seeds until crisp, about 15 minutes. Remove to a rack to cool. Continue to cook the squash until tender enough to pierce easily with a fork, about 30 minutes more (45 minutes total). The cooking time will vary depending on the size of the squash. Remove the squash from the oven and cool slightly. Measure out 1 ½ cups cooked squash (reserve the rest for another use) and place in a food processor or blender. 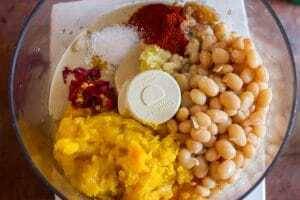 Add the beans, tahini, lemon juice, paprika, salt, garlic, and any optional spicy ingredients you like. Process or blend until very smooth, scraping down the sides of the bowl as needed. Serve drizzled with more olive oil and sprinkled with the crunchy squash seeds. Megan Scott is an advocate of home cooking and local food. She works full-time for the Joy of Cooking alongside her husband John Becker. Her work for JOY involves a little bit of everything from writing, public relations, and social media to recipe development and food photography. She is JOY’s blogger-in-residence, works with John on digital projects, and has written for Culinate, Food52, and PUNCH. She was part of the editorial team for the Joy of Cooking iOS app, and is currently working on the next major edition of the print book, due out in 2019. Follow Megan and the Joy of Cooking on Facebook, Instagram, and Pinterest. I’m definitely going to try this. It sounds so delicious and our garden was very good this year. We have a ton of Buttercup squash! I just have to buy the tahini sauce. Now I need it for more than one recipe! I’m thinking of using a pumpkin. What do you think? Thank you for joining the community? Thank you so much for joining in! This sounds delicious. Can’t wait to try it. Thanks for the warm welcome, Cheryl! My husband & I simply love any kind of squash. This sounds delightful! So do we! Thanks for commenting!